The NEC rules that govern PV systems are very comprehensive and complicated, and as a result, could easily be misinterpreted. Mike Holt helps you better understand how the NEC safety requirements should be applied to all solar photovoltaic systems. 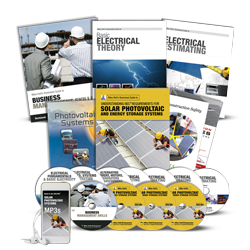 All these great Solar Photovoltaic resources in one great package! Understand electrical theory, how to build and run your business profitably, how to install solar PV systems, and how to be Code compliant. The DVDs are an essential part of the learning process. Mike and his panel of solar industry experts weigh in on all the topics, discuss their implication and application in real-life installations. The library includes field inspection and OSEIA safety guidelines. The perfect program if you are looking to take an upcoming NABCEP exam and have met all the requirements to sit for the test. Includes solar installations, Code requirements, and field inspection and OSEIA safety guidines. The NEC rules that govern PV systems are very comprehensive and complicated, and as a result could be easily misinterpreted. 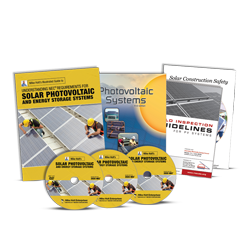 This DVD program, with the panel of international solar experts, covers the important NEC rules that apply to solar systems. The intent is to help you better understand how the NEC safety requirements should be applied. This textbook will help you learn the NEC requirements that govern Solar Installations. The scope of the textbook covers the general requirements contained in Articles 90 through 480, as well as the specific rules relating to solar PV systems, Articles 690 and 705. No time to sit and read? Take Mike's Understanding NEC requirements for Solar PV installations on the road with you. The audio can be played on your computer, or any standard MP3 player.